RadioShack, the mall-staple electronics chain, filed for chapter 11 bankruptcy last week and will soon be delisted from the NYSE, despite getting loans this past September that kept the retailer afloat. It's not an unexpected move, as the iconic chain has been struggling for years to adapt to an ever-changing and converging electronics market rife with new competitors ranging from the Apple Store to big-box retailers like Walmart and Target to online retailers and warehouse resellers. In the sports world, fantasy leagues allow us to act like general managers and/or franchise owners. I can't help but imagine what I would do to reinvent RadioShack. Call it a game of "fantasy CEO," if you will, and I encourage you to play in the Comments section, as well. If RadioShack fails completely (think chapter seven), it would be one more AV tombstone to add to a graveyard that includes Circuit City, The Good Guys, Tweeter, Ultimate Electronics, and countless independent dealers. But I don't think these companies need to fail. The electronics business is booming in many sectors as convergence becomes an everyday reality, specifically for Millennials who seem to do everything on their phones. Specialty AV companies need another pipeline to sell quality gear (careful choice of words there), as Magnolia/Best Buy can only sell so many lines successfully. 1. Change the name and change the look. RadioShack is associated with selling questionable gear like the TRS-80 computer, junky remote-control cars, and cheap batteries. A new name for the company allows for a change in presentation to the client that's more future-oriented. 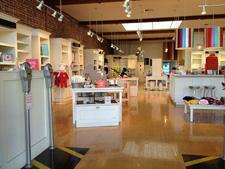 Changing the look of the store would include a more airy, bright, futuristic, clean look. I would look to hire an architect like the one responsible for creating a "design language" for boutique retailer James Pearse (shown right). People believe what they see, and what they see at RadioShack today is old-school clutter--nothing like more the enlightened retailers in other categories. 2. Sell fewer products in the good-better-best model. This is Steve Jobs 101, and it has also been done expertly at a children's store called Giggle. Giggle sells cribs, but not too many of them. Just good-better-best. They do the same with strollers and so on. The Apple Store follows the same model. I propose the new RadioShack would do the same. Sell Ultra HD TVs, but only the best ones of the year in terms of value and performance. Same with speakers, soundbars, remote controls, media servers, cell phones, and so on. Buying key products in greater volume likely could improve profit, and it makes training easier. 3. Automate the existing parts business. Selling batteries, interconnects, and AV parts is profitable, but too much real estate is given to this part of the business in current RadioShack stores. I propose to create a system where more parts are stored in-store but shopping for them is done through a touchscreen system that spits out the needed part to the customer at his or her whim. 4. Hire only commissioned salespeople. Firing the commissioned salespeople was the downfall of Circuit City back in the day. On the floor of the new RadioShack, there will be trained salespeople looking to make sales, not just take orders. Show how managers and top salespeople can make a six-figure living selling AV gear, phones, parts, batteries, and beyond. It can be done and will create a more vibrant, exciting, educated, and professional store that will increase sales. Incentivize the best-selling stores, salespeople, and managers with bonuses, trips, and other goodies. 5. Make education a high priority. Set up a university-style campus where staff can go and learn, getting hands-on time with the gear that the store will sell, or perhaps partner with an online university for the program. Give the salespeople accreditation for learning all about a product category. Repeat this every few years to keep them up to speed on the latest and feeling good about their skills. Offer in-store learning sessions for new products. Offer online educational sessions so that salespeople are experts, not clerks. The competition sells "big boxes" or TVs next to pallets of toilet paper. The new RadioShack should aim to be a company staffed with educated experts. The companies that would be represented in the store should pay for the cost of this, at least in part. 6. Sell media: music, movies, TV content...I don't care what it is. If it's good content, show it and sell it. If you walk into the store, there should always be a "wow" presentation. Something aspirational, even if you don't have the money (or credit) to buy it today. Play good, new music. Stream the best new TV shows. Put together screenings that make the stores seem hip like Giggle or Apple Stores. Forget the retro vibe, as it's not cool. 7. Sell expert service and installation. Like Best Buy and Magnolia has installers, the new RadioShack should do the same. Train them to calibrate TVs. Teach them how to install speakers, networking systems, alarms, cameras, cell-phone repeaters, satellite systems, and so much more. This way, as the housing market comes back, you've literally got everything that someone needs who wants to live the connected lifestyle. 8. Offer really creative financing. It's one thing to blow somebody away with a great AV demo or show them the computer that they dream of owning. It's another thing to get them to spend on it. Find a bank that will give generous credit so that people can justify taking home their next new goodie...that day. 9. Stock what you sell. Gear sells better when commissioned salespeople have profitable, high-performance gear ready to sell. When AV can be sold as an impulse buy as opposed to a special order, it sells better. This likely means that less product can be sold, but that's okay, too. Just like Giggle (shown right), stock only the key products. 10. Recycle: Offer free (or cheap) e-cycling to anyone who comes in and buys anything, be it a pack of batteries or a $10,000 Ultra HD TV. Getting rid of that mercury-loaded CRT TV from 20 years ago overcomes a physical objection that could help sell quite a few more new TV sets. Moreover, if someone comes in with a broken-down VCR and wants to recycle it, even if it costs $20 to the store, you get to know the customer's e-mail, phone number, and (likely) purchase patterns. 11. Create a sophisticated CRM for the entire company. A CRM is a sales software system that allows you to track customers, deals, opportunities, and more. Top hotels keep track of your preferences with systems like this, as should the new RadioShack. What have you bought? What do you want to buy? Where do you live? What product categories are you interested in? What product categories are you not interested in? Can we e-mail you special offers or invites to special events? This information is gold. Pro salesmen can make more and better sales with it. The more you know about the client and the account, the better your customer service will be. I could go on and on about what to do with RadioShack, as its fall from grace has been amazing to me. They own a channel in the market that could be so powerful. There are retailers, hotels, airlines, and other forward-thinking companies using the above tactics to create an amazing experience that brings customers back over and over again. Why couldn't a reinvented RadioShack pull off the same feat? I think they could. If you were the new CEO of RadioShack, what would you do to the company to make it a success? What examples of successful tactics would you suggest to someone who would take over the company? Or should RadioShack just fold and let the Internet, big-box, and warehouse stores sell all of the electronics? • Should You Open a Stereo Store? at HomeTheaterReview.com. • How Would You Start a New AV Company? at HomeTheaterReview.com. • RadioShack Cuts the Cord After 94 Years, Files for Bankruptcy at Forbes.com.